A trackhoe scoops rocks from the banks of the Roaring Fork River on Thursday in Basalt. Pitkin County officials and their consultants considered last year a break-in period for the whitewater park. Two wave features were created last year. Many rafters and kayakers said the upper feature created too tough of conditions during high water in June, with some describing the effect as a “nasty hole.” The Pitkin County Healthy Rivers program has commissioned additional work to create a “slip lane” around the features to give the option to bypass the toughest parts at the toughest times. The Basalt Town Council spent roughly one hour Tuesday assessing the performance of town attorney Tom Smith, then decided more time is needed for the task, according to Mayor Jacque Whitsitt. Smith wasn’t in the room for the discussion. Smith was hired in August 2005 to replace Jody Edwards. This is the first time the council has undertaken the attorney’s performance review. Whitsitt said the council will likely resume the review at the next meeting. She declined to comment further because it is an executive session matter. One of Basalt Town Council’s highest priorities for 2018 will be assessing how the addition of hundreds of public- and private-sector affordable-housing units in the midvalley has affected demand. Last year was prodigious with the addition of 46 rental units at El Jebel Mobile Home Park, 27 for-sale condominiums for teachers and 50 price-restricted apartments at Willits Town Center. The completion of the Roaring Fork Apartments next to Stubbies in Basalt this spring will add another 56 units of housing geared toward low-income households. That will boost the total affordable units coming online in 2017 and 2018 to 179 units. In addition, Habitat for Humanity Roaring Fork is teaming with the Roaring Fork School District and Pitkin County to build 27 residences by Basalt High School. Stott’s Mill is approved for a residential project that includes 25 deed-restricted affordable-housing units. The Tree Farm project in El Jebel earned approval for a plan that includes 40 apartments with rent controls and 10 deed-restricted sale units. The project will include 150 units that will be reserved for sale to Roaring Fork Valley residents for the first 60 days after they come on the market. After that, any unsold unit can be offered on the free market. There will be no restrictions on prices of those 150 units but Eagle County contends they qualify as affordable housing. Councilman Gary Tennenbaum said a significant amount of affordable housing has been added to the midvalley mix. “We need a way to assess how that’s impacting our needs,” he said. Councilman Bernie Grauer said examining the affordable-housing need should be on the town government’s priorities list every year. The projects weren’t ranked in any order. What started as a top-10 list proposed by Town Manager Ryan Mahoney expanded to a baker’s dozen items. To no one’s surprise, resolution of the former Pan and Fork property saga was a leading priority. The focus has changed a bit because a new developer has emerged and is working on a plan for the 2.3 acres between Midland Avenue and the Rocky Mountain Institute’s Innovation Center. A group led by Tim Belinski has a contract to buy the property from the Roaring Fork Community Development Corp. for slightly more than $3 million. Mahoney said he anticipates Belinski’s group could have a sketch plan submitted by May. Looking at the town’s capital improvements plan, including street repairs, parks improvements and fleet-equipment replacement. Bid out prime street projects such as resurfacing the roundabout at Willits and projects on Two Rivers Road. Finding land to purchase for a new public works facility. 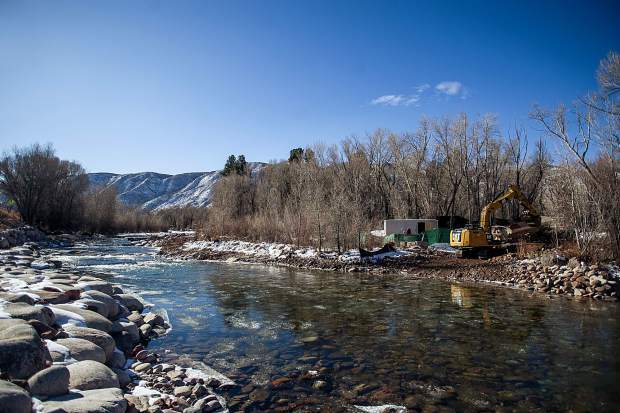 Completing out-of-water improvements to complement Pitkin County’s whitewater park on the Roaring Fork River across from the Elk Run entrance. Updating the town master plan and syncing it with Eagle County Mid-Valley Master Plan. Mahoney and the council also want to explore coming up with a coordinated land use master plan with Eagle and Pitkin counties that would affect all of the midvalley. Such an effort would require give and take between the governments, Mahoney said, but it’s been achieved in other jurisdictions in Colorado. He said Larimer County and Estes Park coordinated their plans when development on the fringes of the town became an issue. Tennenbaum noted that the city and county of Boulder also coordinated their plans. “It can be done. It just needs political will to do it,” Tennenbaum said.